The Amazon Basics 12 Sheet AU1228XB is a paper shredder for home use. In offices it can be used as a personal, desk-side shredder for low duty use. It will also render CDs or DVDs unreadable, too. The Basics AU1228XB is a “lift off” document shredder that delivers a cross-cut to paper. That means the paper is cut into strips and the strips into fragments, in this case, 5x55mm long. With this model the paper destroyer sits atop a generous plastic waste bin. There’s a porthole, so you know when the bin is full with paper shreds. A paper shredder is a handy way to dispose of junk mail, private financial reports and statements. It preserves privacy and prevents document based identity fraud. This particular Amazon model has a security or DIN rating of DIN 3. That means the paper chaff produced is indecipherable. Amazon Basics 12 Sheet Shredder - What’s in the Box? 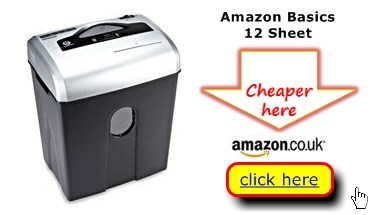 The Amazon Basics 12 Sheet AU1228XB is variation on the classic lift off shredder design. The cross cut cutter head fits securely onto an enclosed plastic waste bin with a viewing window for convenience. The cutter head does not nest securely on the plastic bin so the Amazon Basics AU1228XB can be tricky to move. The enclosed waste bin stops paper dust. However, at waste bin emptying time, you have to lift off the cutter head. This will deposit some paper shreds onto the floor/desk. This last criticism is typical of any lift-off paper shredder. At Best Buys for we make use of our owner surveys to uncover not only the cheapest, but also the best paper shredders for home use. It’s true, for peace of mind; you can’t beat the security delivered by a cross cut shredder. This reasonably high endurance model, chomps through sensitive papers, confidential statements and private documents, including any staples. Your privacy and identity protection deserve no less. Best Buys for is a consumer resource presenting user ratings, insights and price comparison details on shredders for use at home or in the office like the Amazon Basics 12 Sheet paper shredder.